Hamilton’s Olivier Award-winning actor Giles Terera will present his new play The Meaning of Zong on Bristol Old Vic’s stage this Thursday (11 Oct) for a one-night-only workshop performance. The piece examines the massacre aboard the slave ship Zong in 1781 and the repercussions of these events, which influenced the growing abolition movement in the UK. This rehearsed reading will be followed by a free post-show talk with Giles Terera, Tom Morris and the cast. Jointly commissioned by the National Theatre and Bristol Old Vic, this October marks the first public sharing of The Meaning of Zong ahead of the play being fully staged in 2019. Giles Terera is an acclaimed actor, musician and filmmaker, currently starring as Aaron Burr in the UK production of Lin-Manuel Miranda’s Hamilton – The Musical, for which he won the 2018 Olivier Award for Best Actor in a Musical. The Meaning of Zong is his debut play. Previous theatre credits include The Merchant of Venice (Globe Theatre and International Tour), The Book of Mormon (West End) and Hamlet (National Theatre). Giles is joined by a stellar cast from stage and screen. Danny Sapani is known on television screens for his appearances in Harlots, Penny Dreadful, Misfits, The Crown, and Broken. His film credits include Danny Boyle’s Trance and The Siege of Jadotville, alongside blockbusters such as Star Wars: The Last Jedi and Black Panther. Danny’s extensive theatre work includes numerous productions at the National Theatre, including the leading role of Ephraim in the critically acclaimed Moon on a Rainbow Shawl, as Jason in Medea opposite Helen McCrory and as Tshembe Matoseh in Les Blancsdirected by Yael Farber. His other theatre credits include; Wig Out at The Royal Court, the title role in Out of Joint’s production of Macbeth, To the Green Fields Beyond at the Donmar Warehouse and Brutus in Julius Caesar at The Globe Theatre. Bristol-based actor Tristan Sturrock also joins the cast. His previous theatre credits at Bristol Old Vic include Handel's Messiah, The Little Mermaid, Peter Pan, Coram Boy, Treasure Island, Juliet and her Romeo and Far Away. He has been a performer with renowned theatre company Kneehigh for 30 years and toured the UK as Maxim de Winter in Emma Rice’s Rebecca. Television credits include Poldark, Three Girls and Death in Paradise for the BBC as well as The Crown (Netflix). Film credits include Disney’s recent feature film Christopher Robin. Enyi Okoronkwo, who most recently played Trofimov in Michael Boyd’s The Cherry Orchard at Bristol Old Vic, joins the workshop ensemble. He currently stars as James in the upcoming Netflix production Giri/Haji. Enyi’s previous theatre credits include Talc in Headlong and Bristol Old Vic’s Junkyard and Luke in Rufus Norris’ wonder.land (National Theatre). The Meaning of Zong marks the welcome return of Akiya Henry to Bristol Old Vic, where her credits include Swallows and Amazons, Medea and A Midsummer Night’s Dream. Akiya has also recently played Olivia in Twelfth Night at The Globe and performed in Emma Rice's The Little Matchgirl. Georgia Frost and John Leader return to the Bristol Old Vic stage having recently completed a run as Sully and Harry respectively in Sally Cookson’s critically acclaimed A Monster Calls. Georgia trained at Bristol Old Vic Theatre School where she performed in 13 at Tobacco Factory Theatres and Crave at The Wardrobe Theatre and has since appeared in Theatre Royal Bath’s Little Mermaid. John’s theatre credits include War Horse and Peter Pan (National Theatre), Romeo in Orange Tree Theatre’s Romeo and Juliet, Four Season: A Reimagining (The Globe) andThe Lion, The Witch & The Wardrobe (Leeds Playhouse). The cast also includes Emmanuelle Cole and Tom Byam-Shaw. Emmanuelle’s theatre credits span An Octoroon (National Theatre), The Curious Incident of the Dog in the Night Time (National Theatre), Kingdom Come (RSC) and The Iliad at the Edinburgh Lyceum, for which she was nominated for Best Female Performance at the Critic’s Award for Theatre in Scotland in 2016. Tom has appeared as Franz Kafka in the TV Series Genius and Wafiq in FX’s Tyrant. His theatre credits include Tender Napalm at Southwark Playhouse and The Tempest at Theatre Royal Haymarket. 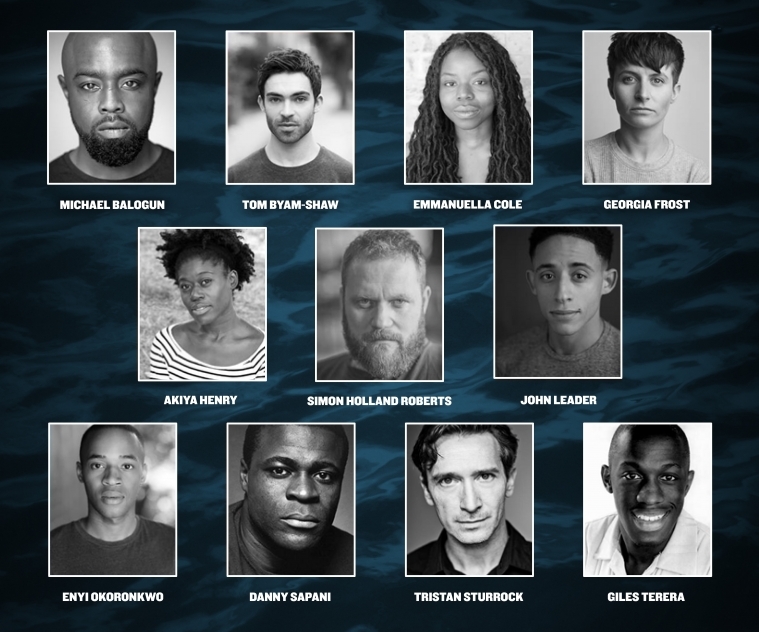 Finally, the cast is rounded off with Michael Balogun and Simon Holland Roberts. Michael is a recent graduate of RADA. His theatre credits include Macbeth (National Theatre) and People, Places and Things UK Tour (Headlong). Simon is currently working as Artistic Director for ‘Unbind The Wing’ and has previously appeared in several productions at Theatr Clwyd, including The Taming of the Shrew, Glengarry Glen Ross, Hamlet and All My Sons. Musician Michael Henry accompanies the workshop performance. He is a vocalist, composer, educator and music director who works across genres and disciplines. Trained as a clarinettist and composer at the Royal College of Music, he moved into work as a backing vocalist for international stars Chaka Khan, Diana Ross, Barry Manilow and the Pet Shop Boys. Recent major compositions include his opera Circus Tricks for Tête à Tête, Rocket Symphonyfor Linz: European Capital of Culture, and Stand for BBC Proms.